Algonquin Young Readers, 9781616205867, 240pp. LET'S GET THE FEMINIST PARTY STARTED! Have you ever wanted to be a superheroine? Join a fandom? Create the perfect empowering playlist? Understand exactly what it means to be a feminist in the twenty-first century? You’ve come to the right place. Forty-four writers, dancers, actors, and artists contribute essays, lists, poems, comics, and illustrations about everything from body positivity to romance to gender identity to intersectionality to the greatest girl friendships in fiction. Together, they share diverse perspectives on and insights into what feminism means and what it looks like. 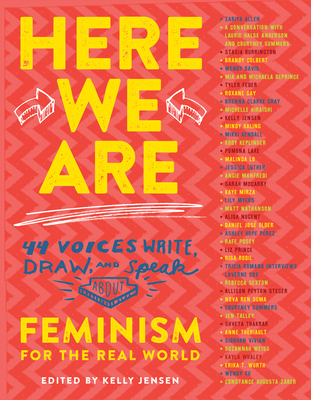 Come on in, turn the pages, and be inspired to find your own path to feminism by the awesome individuals in Here We Are. Welcome to one of the most life-changing parties around! Kelly Jensen is a former librarian-turned-editor for Book Riot and Stacked. She’s the author of It Happens: A Guide to Contemporary Realistic Fiction for the YA Reader. She loves black licorice and debating genre. Follow her on Twitter: @veronikellymars.